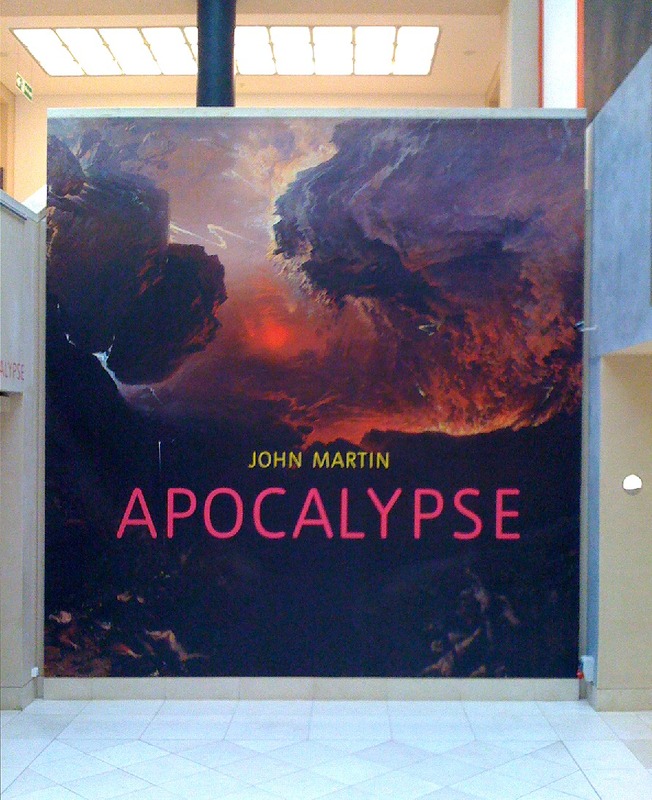 Ever since it was featured on the cover of Fortean Times last November, I’ve been intending to go to the Tate Gallery’s John Martin: Apocalypse exhibition... and I finally got round to it just before it closed. It certainly lived up to its billing -- a huge exhibition of huge canvases, by one of the most imaginative and technically brilliant painters of the nineteenth century. Photography wasn’t allowed inside the exhibition, so I had to settle for the outside of it (see left). In any case, Martin is one of those painters whose work loses virtually all its impact when it’s reproduced photographically... even the twelve-foot high poster shown here failed to capture the vivid, glowing colours and almost three dimensional depth of the originals. The most astonishing fact about John Martin is that he is so obscure. I only stumbled across his work last year, when I was doing some picture research for this blog... and then by coincidence read the article in Fortean Times a couple of months later. In his own time, Martin was immensely popular with the general public, but reviled by the British art establishment -- who saw him as a mere “entertainer” or “showman” rather than an “artist”. This pigeonholing seems to have sealed his fate for posterity. Martin’s depictions of the Apocalypse (such as the one shown in the poster above: The Great Day of His Wrath) were late works, dating from the 1850s. 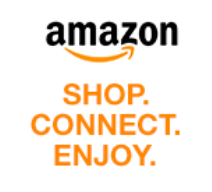 His best paintings actually came thirty or forty years earlier. Many of these portray vast, decadent cities that in one way or another incurred the Wrath of God: Sodom and Gomorrah, Gibeon, Nineveh, Babylon and even Pandemonium... the Capital City of Hell. All these monumental cityscapes—some of them distinctly science-fictional looking—came from Martin’s own vivid imagination. His painting of the Fall of Nineveh, for example, dates from 1827... twenty years before the ruins of that ancient city were first excavated by archaeologists. John Martin had to conjure up the capital city of the Assyrian Empire from his imagination. I, on the other hand, merely had to travel two miles from the Tate Gallery to the British Museum... where there are several rooms filled with wall sculptures plundered from the ruins of Nineveh. 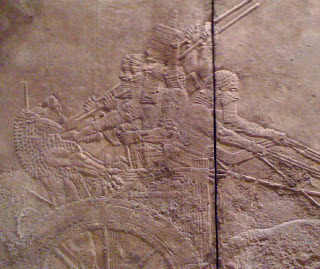 Unlike the Tate, the British Museum does permit photography: the picture on the right depicts Ashurbanipal, the last king of Assyria (685 – 627 BC), killing a lion. 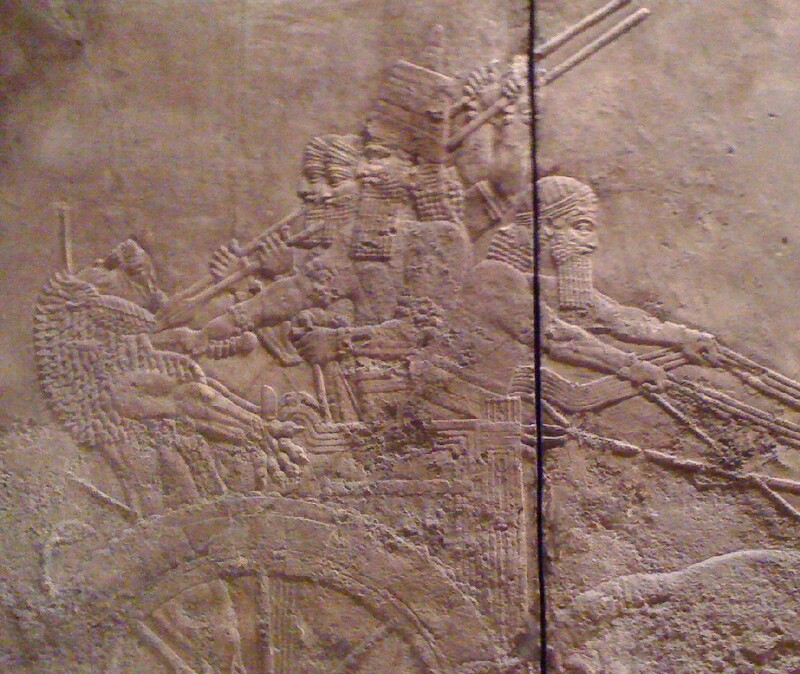 This panel comes from Ashurbanipal’s Northern Palace in Nineveh, and of course it would have been on display in 612 BC when the city finally fell to Babylon (though perhaps not quite as spectacularly as John Martin imagined it). In Graeco-Roman culture, Ashurbanipal was referred to as Sardanapalus, and in this form his downfall can be seen in a painting called The Death of Sardanapalus by Eugène Delacroix -- a French contemporary of John Martin. The Sardanapalus painting dates from 1827, the same year as Martin’s Fall of Nineveh, and it’s as vast and spectacular as anything Martin produced. The French, however, don’t have the same hangups as the British when it comes to labelling cool stuff as art: they put it on display in the Louvre!